When my friend Cecille and I decided to go on a food trip today, we agreed to go to the newest restaurant in Campo, Lahug called Manggahan. Both of our friends have been raving about this restaurant in Cebu that my curiosity got bigger as I also wanted to see what food they were serving. So when we arrived at the place, I expected to see a small dampa style restaurant similar to that of AAs B-B-Q Grill but I was surprised to see that the resto looked fancy. 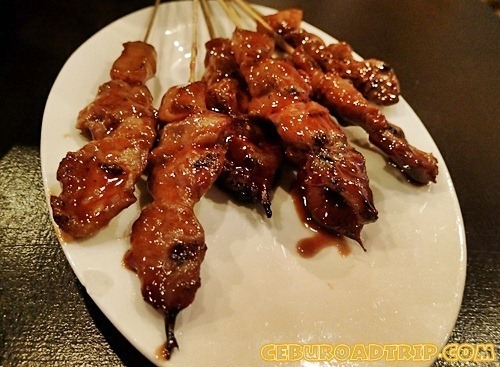 When you reach the place, the gravel-filled parking space will greet you and smoke coming from the right side of the restaurant indicates that barbecue sticks are being grilled. Tables that are facing the road are available but if you don’t want to go home smelling smoke all over, I would suggest you find another table inside the restaurant. Upon entering, you will see big tables in their main dining area. A big picture of a mango tree with the name manggahan adorns the only visible huge wall in there since the other 2 sides of this small restaurant is covered with glass windows. There’s also a small platform on that side of the wall and I’m guessing that one can use that when live bands entertain diners. Across that mango tree décor is the restaurant’s bar where antique-looking mirror frames hang on the walls. Antique-looking because the mirrors looked like the mercury lining on its back had been scraped off to give that look. 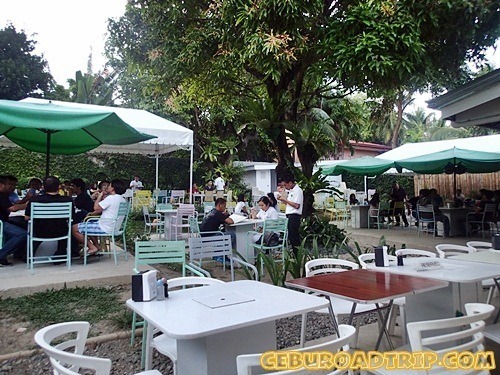 Aside from the open dining area at the front of the restaurant, there’s also a bigger dining area in their backyard. This one’s ideal for drinking sessions with friends or those who want to have a meal by the garden. During the summer season, the heat could be unforgiving so choose wisely on where you want to dine. When we asked for the menu, we were surprised to see the cheap prices of their dishes. It was too good to be true. Looking at the menu alone, I already imagined this place as being the perfect hang out resto for those eating on a budget. With the affordable dishes that they serve, one could easily go on a food trip and spend lavishly without minding their pockets. I just didn’t like one of the dishes listed on the menu. 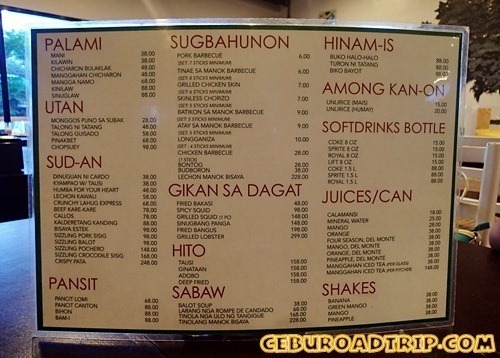 When I browsed through the menu, I saw Sizzling Crocodile Sisig in there. I cringed at the thought of imagining eating a crocodile. Poor creatures. I mean is it allowed to slaughter crocodiles now in order to eat them? I hope Manggahan has a permit to sell crocodiles as dishes in a legal way. Well, I just hope they stop selling those. Another item on their menu caught my attention too. Under their rice section, it shows “Unlirice (Mais)”. Weow! It’s really rare for restaurants to serve mais as rice and I commend Manggahan for serving this type of rice. Certain Cebuanos or the Bisayas in general are fond of eating corn rice and it’s wonderful that mais-lovers now have the option to order this kind of rice in a restaurant. Since there were only 2 of us dining and we were on a budget, we chose wisely what to order. As much as we wanted to try everything on the menu (except for balot and the crocs), we just ordered a few dishes. 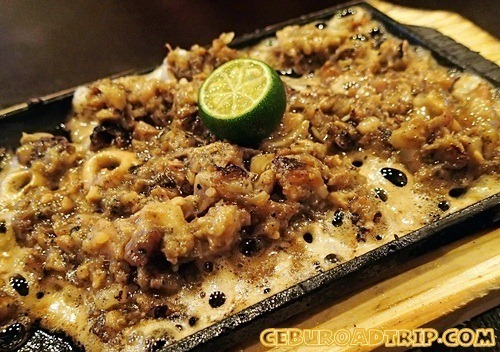 The first dish they served was the Sizzling Pork Sisig. At 98 pesos, I find the serving too small. I hope the restaurant either lowers the price of the pork sisig or they increase the quantity of this dish. The taste is ok. Nothing fancy. Your usual sisig. We also ordered the Monggos puno sa subak for 28 per bowl. This one’s good for 1 person but my friend and I shared this. 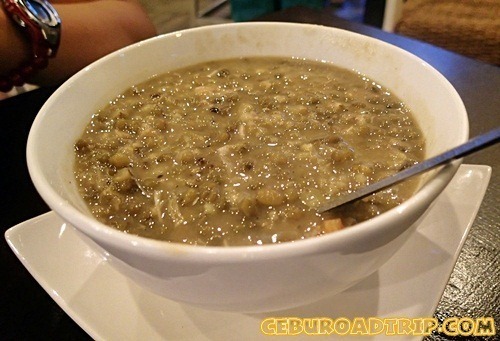 Monggos puno sa subak means monggo beans soup mixed with ample servings of ingredients like flaked fish, vegies and more. I failed to notice if it was indeed full of subak but Cecille saw some fried dilis (long-jawed anchovy) in there.The taste of this dish was ok. It failed to amaze me or I didn’t get that WOW factor when eating the monggos though but I’d still recommend this affordable dish to anyone. While we were still halfway through our dinner, the staff already served the dessert we ordered. 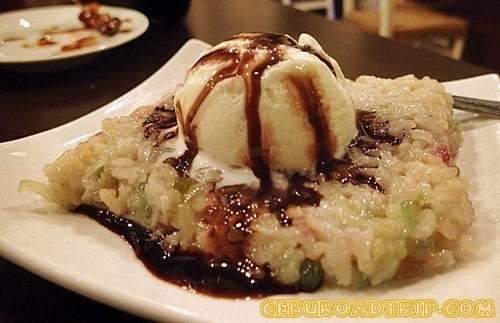 I wish they could have asked us if we wanted our dessert served since we ordered the Biko Binayot. I think it is common sense for any restaurant to ask their diners if they want the dessert served especially if what was ordered had any melting toppings. Anyway, Biko Binayot is actually biko topped with ice cream and chocolate syrup. Biko is a native delicacy also known as rice cakes. They called this Biko Binayot because of the colorful coating of the biko. There are also small sagos in there. But this dessert was a disappointment. I love kakanins and this one’s not biko. If there’s anything that best describes this dish is that it’s loose sticky rice or basa na biko (wet rice cake). It also didn’t taste sweet, which diabetics would rejoice I guess. I just didn’t find the combination of this basa na biko and ice cream appealing. 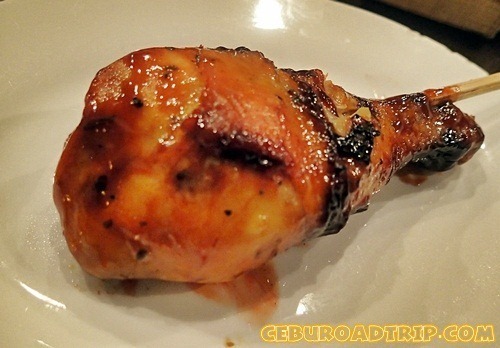 I hope Manggahan would review this dish since it doesn’t make any sense to me at all. Except for the dessert, the dining experience was great at Manggahan. We were so full after consuming everything we ordered (except for the biko). When the bill came, it was a whopping 412.00 for all of that. If we didn’t order the biko and just ordered regular drinks, we would have only paid P266, which wasn’t bad at all. Manggahan also serves beer, liquor and cocktails at reasonable prices. 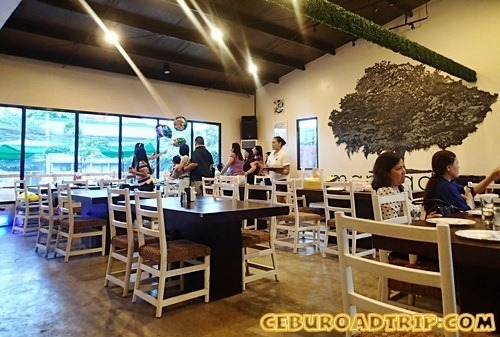 With their hours of operation and affordable dishes, it’s no wonder why many Cebuanos would prefer to hang out in this restaurant in Cebu City. And if you were to ask me if I’d still come back in this affordable restaurant in Cebu, that’s one big YES! 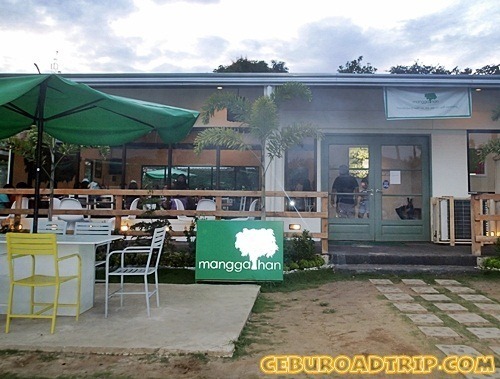 How to get to Manggahan Restaurant? If you are bringing a car, you just need to head to the Camp Lapu-Lapu at Lahug. If you are commuting to Manggahan, just ride any Lahug-bound jeepney with an 04C label. These jeepneys ply the Campo Lahug route so better hop on that one and tell manong driver to drop you off in front of Manggahan. If you are going to Manggahan by taxi, simply tell the driver you want to go to the Manggahan restaurant near Campo Lahug. The hours of Operation of Manggahan restaurant is from 5:00 am to 3:00 am on weekdays. They are open 24 hours on weekends. Doi is a certified zombie. After being introduced to the world of blogging, social media and online marketing, she has used all the means necessary to enhance this new found passion and use it to her advantage. Her nature to explore new places and share it with the rest of the world is what keeps this wanderer going and seeking for more exciting trips and adventures. 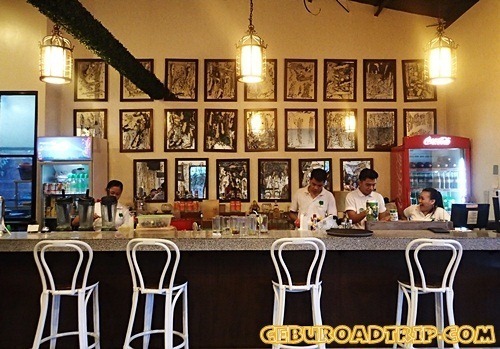 Get the latest updates and alerts from Cebu Road Trip! On the over-eagerness to serve our dessert I think they were pushing us to finish-up fast so our table will be free. I have actually mixed feelings about their overall service. Hmmm. But if sa barato aspect, yep they are affordable. Yeah, same here. no crocodile meat for me.